It was on February 01st, 1948 that the Chief of Staff, General Lucien Leboutte decided of the creation of the 15th Wing Transport and Communication. This Wing included the 20th and 21st Squadron, former 366th and 367th Squadron from the 169th Wing. But the origins goes back to 1944, when the British Air Ministry decided to withdraw all Her Majesty pilots from the 525th Squadron, which in terms became exclusively a Belgian squadron. During April 1946, 525th Squadron was established definitively in Belgium at the airport of Evere, followed by the "Belgian Flight of Metropolitan Communication Squadron" from hendon. These two units were to from the 169th Wing still headed by the Royal Air Force. The 366th Squadron was equipped with with 5 C-47A Dakota, whereas the 367th Squadron flew 9 Avro Anson, 6 Airspeed Oxford, 4 DH.89 Dominie and 3 Percival Proctor. The 366th Squadron was to enlarge its fleet by one C-47 Dakota a week, chosen between the surpluses of the USAF stock at Furstenfelbruck. In 1947 the inventory of the 169th Wing recorded also 3 Hawker Hurricane used mainly for fast liaison or metrological reconnaissance flights. Also to be said is that one of the other missions entrusted to the 169th Wing was the transport of VIP (Very Important Persons). After the war, the Belgian Prince Regent flew back to Belgium aboard one of these C-47 Dakota. Back to the 15 Wing; in 1950, the Wing left Evere to be established definitively at Melsbroek (military part of the airport of Brussels National). 1950 was also marked by the acquisition of 2 C-54 Skymaster (DC-4) which were used for flights to the Belgian colonies in Congo. As the acquisition of a tactical military aircraft was a necessity, the choice fell on the Fairchild C-119 Flying Boxcar and October 07th, 1952 saw the inaugural flight in Belgian colors. The C-119 was undoubtedly the spearhead of the 15th Wing during those early years. However, one need to know that delivery of these aircraft took place in several stages: 18 C-119F, 22 C-119G and finally 6 more G-types in 1958 totaling 46 airplanes. These 46 planes were never used simultaneously as cut-saving plans already existed in 1954. 18 F-type aircraft were resold: 8 to Norway and 10 to the USAF. Regarding the number of aircraft left a third squadron was integrated into the 15 Wing, the 40 Squadron (Green Sioux), but, due to the cut-savings, lasted only for a short period of time (from November 01st, 1954 till April 30th, 1955). 1953 saw the 21st Squadron modernizing its inventory. 12 Percival Pembroke were ordered to replace all the aging planes, except for the DC-4. These last ones were replaced in 1960 by 2 DC-6A (ex-USAF) and 2 DC-6B (ex-Sabena). 1960 was also the year of the independence of Congo and the aircraft and crew from the 15th Wing were to live hard times. Missions flown were mainly transport of troops and the evacuation of Belgian colonial residents. As the demand for aerial transport was increasing, the 40th Squadron was reinitiated on December 01st, 1960 and stayed operational until the retirement of the C-119G in 1972. During the 60's, the 21st Squadron became the Royal Transport Squadron and it was aboard aircraft of this squadron that King Baudouin I flew numbers of his official visits. With the arrival of the C-130H Hercules in 1972, the 15th Wing underwent a drastic reorganization. These 12 C-130H replaced about 30 C-119G and so the personnel involved was also reduced. 1976 saw the last withdrawal of the trusted "DAK" but also of the Pembroke and DC-6 from the 21st Squadron. This squadron was then equipped with 2 Falcon 20E, 6 Fairchild Swearingen Merlin III, 3 Hawker Siddeley HS.748 and 2 Boeing B727-29QC (Quick Change) acquired from Sabena. The C-130H Hercules was also to boost the humanitarian missions of the 20th Squadron. Everyone recalls the deployments in the Sahel desert, in Angola, Guatemala, Somalia, etc... These aircraft lived also hard times in 1978 during operation "Red Bean" with the dramatic events in Kolwezi (Shaba). In 1995 a single Falcon 900D was added to the fleet and 2 years later, in 1997 two former Singapore Airlines Airbus A310 joined the 21st Squadron to replace the two Boeing B-727-29QC. Beginning of the year 2000, the 21st Squadron was again in a modernizing phase. The old HS.748 and Swearingen Merlin III were abandoned in favour of the Brasilian Embraer ERJ135 and ERJ145. The first ERJ135 was delivered in 2001 and during the press presentation; the chief of the Air Force announced the agreement signature for the future tactical transport aircraft A400M from Airbus Military. Belgium ordered seven aircraft plus one for Luxemburg that will be based at 15th Wing also. The Falcon 20E fleet was upgraded between March 2004 and February 2005. In 2010 the two Airbus A310 are set out of the fleet and the A310 task was taken by a single A330 leased to Hi Fly Portugal as from November 2009. December 2014 and December 2016 saw the respective retirement of the CM-01 and CM-02 (Falcon 20E). The rumor is now that the Falcon 900D will be retired end 2018; the ERJ145 CM-04 was already retired in 2018 for economical reason and the rest of the Embrear fleet will follow but without date fixed currently. 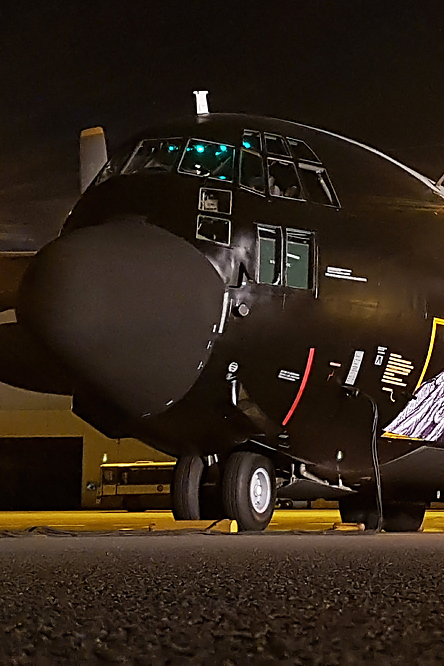 The year 2018 saw also the retirement of the C-130H CH-08 because he was at the end of is potential before an heavy maintenance. After 70 years, the current situation of the 15th Wing is as follow: The 20th Squadron is waiting the new transport aircraft with some impatience and for the 21st Squadron, the future appears less bright, the government seems to prefer the leasing solution instead of a own VIP transport fleet…Wait and see. So, as you have red in the historical part, the 15th Wing Transport and Communication saw the light in 1948. To celebrate this anniversary, the two historical squadrons launched special colour scheme on a C-130H and an Embraer ERJ135. 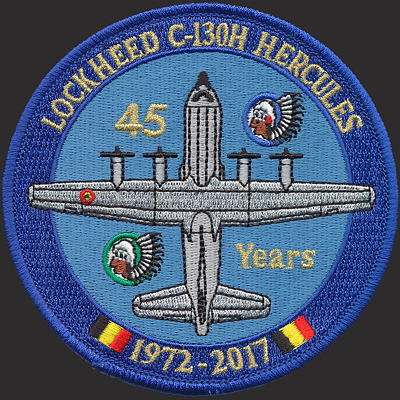 The logo on the C-130H depicts also the 45 years of service of the "Hercules" within the Belgian Air Force. However one has to know that the first C-130H was delivered and accepted by the Belgian Air Force in 1972, so the 45th anniversary should have been celebrated in 2017. But this little detail must not hamper us from admiring the work done by Peter Verheyen and Johan Wolfs. To immortalize the CH-10 and CE-02, the 15th Wing organized an evening and night shoot for the specialized press. SBAP would like to thank the authorities of the 15th Wing for their welcome at Melsbroek airbase. Moreover, a particular thank to "Pé" the Public Relation Officer of the 15th Wing and his colleagues "Kristof" and "Serge" for this glitch free shooting, and also the facilities granted during our stay.